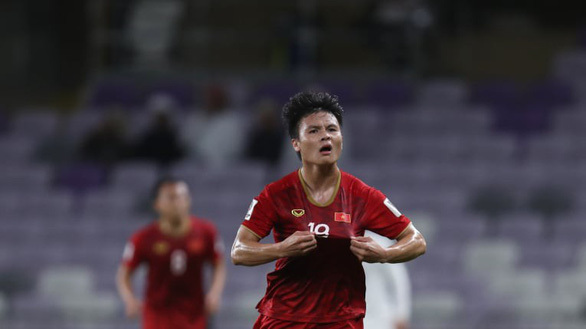 Vietnamese midfielder Nguyen Quang Hai has won both polls to vote for the Best Group Stage Player and Best Group Stage Goal at the ongoing 2019 AFC (Asian Football Confederation) Asian Cup in the UAE. 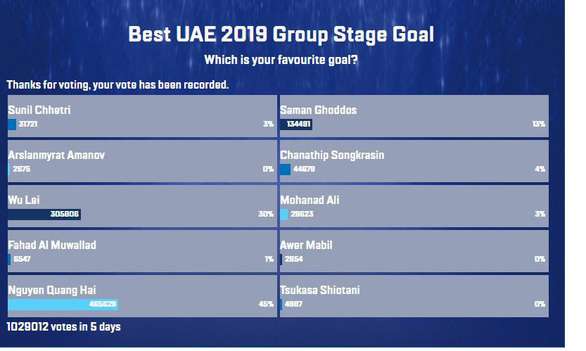 As the exciting group stage of the continental championship saw standout performances, as well as a heap of truly memorable goals from the Asian football talents, the organizers asked football fans to choose the Best Group Stage Player and Best Group Stage Goal of the round via voting. The final results of the polls were released on Tuesday afternoon after four days of opening for voting. Accordingly, Vietnam’s midfielder Nguyen Quang Hai was voted by 604,167 online residents to become the Best Group Stage Player of the tournament. 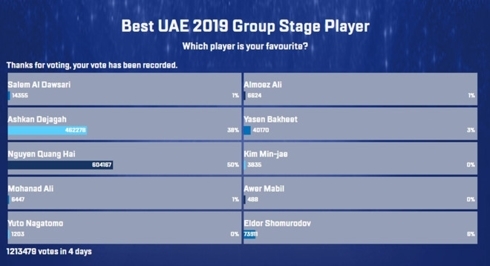 The second-place finisher in this vote was Iranian player Ashkan Dejagah, voted 462,278 times, and Uzbekistan’s striker Eldor Shomurodov followed in third position with 73,811 votes. The other nominees for the best performer in the group stage included Jordan’s midfielder Yaseen Al-Bakheet, Qatar’s Almoez Ali, Iraq’s Mohanad Ali, Saudi Arabia’s Salem Al Dawsari, Japan’s Yuto Nagatomo, South Korea’s Kim Min-jae, and Australia’s Awer Mabil. In the race of the best goal at the 2019 Asian Cup so far, Nguyen Quang Hai also beat nine other contenders to win the prize of the Best Group Stage Goal. Hai’s free kick scored in the match between Vietnam and Yemen in the final game of Group D received 465,629 votes. The second favorite goal picked by Internet users was Wu Lei’s aplomb from 12 yards in China’s Group C game against the Philippines, which got 305,806 votes, while third place went to the goal by Saman Ghoddos of Iran, which underscored his team’s 5-0 win over Yemen, with 134,491 votes. Later on the same day, the 2019 Asian Cup quarterfinal cast was also confirmed after the Round of 16 stage ended. From a starting field of 24 teams, now only eight remain and will face each other in four upcoming clashes on Thursday and Friday, including Vietnam – Japan, China – Iran, UAE – Australia, and South Korea – Qatar. The Vietnamese will challenge the Japanese at 8:00 pm on Thursday (Vietnam time), with the game broadcast live on VTV6.